In recent months, with the continuation of protests and strikes throughout Iran, the people of Iran have shown their resolute in continuing their fight till the dawn of freedom and the overthrow of the mullahs. From the streets of Mashhad and Kazeroon, to the merchants of Baneh, workers of Haft Tapeh and farmers of Isfahan; from Balouchs and Kurds to Fars, Lors, Arabs and Turks, all of Iran is united in the cry for freedom. Their slogans of “Hardliners, Reformers, the game is over” and “Our enemy is right here, spuriously they say it’s America” have made clear that the Iranian people have no illusions about the nature of the regime and have no hopes in reform or moderation under the mullahs and to them it is clear that the source of all the misery of the Iranian people is the theocratic regime ruling Iran. Join the Free Iran Campaign! Stand with the Iranian people as they risk their lives to defeat a brutal dictatorship. Echo the voices of millions living under tyranny. Send a message of hope and solidarity to those fighting for freedom, democracy and a #FreeIran. In early 2018, nationwide protests in Iran took the world by storm, ringing chimes of change and a new chapter in the quest for freedom. The protests have gained new momentum as the Iranian people demand a #FreeIran2018. Join the Campaign on social media using #FreeIran2018 as we strive to echo the voice of millions in Iran and to convey their message to the international community to recognize the desire of the Iranian people for democratic change by the people of Iran and to voice support for the 10-point plan of Maryam Rajavi for the future of Iran. 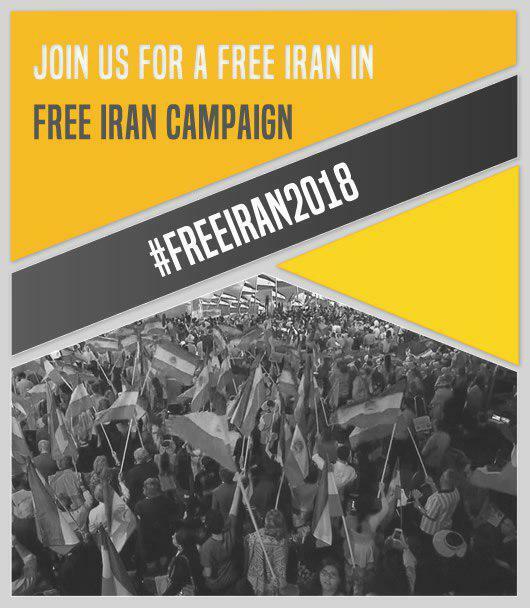 Tens of thousands of freedom loving individuals from across the globe will gather with one simple message “Free Iran” and seeking an end to religious dictatorship in Iran and establishment of freedom, democracy, respect for human rights, gender equality and separation of religion from State. On 30th June we will gather to stand up to the Iranian regime and to call for the recognition of the Iranian opposition as the true alternative for a democratic Iran and the adaption of a new policy by the west which addresses the changing dynamics of the most volatile and strategically important region of the world,supporting democratic change. Write a post in social media or on a blog, an op-ed in your local paper, or a letter to the editor and ask them to give a voice to the Iranian people as they demand freedom in Iran and Iran’s eviction from countries in the region. Share the campaign’s agenda and activities on your Facebook, Twitter, and social media accounts and invite friends to join the campaign and gathering. Writing is often a personalized and direct way to influence both the general public and decision-makers via blogs, social media, and the more traditional media. Anyone can write a blog post. Whether on your personal blog page or on a free hosting site like www.Medium.com, blogs are an informal means to spread awareness, advocate on behalf of a specific position, or share a personal story. Although social media statuses are short, they are often a speedy, reactive means by which to share links, catchy infographs, or photos among one’s network of friends, colleagues, and contacts.al story. Letters to the editor are a great mean to respond to news and provide your opinion. They can be between 100 – 300 words. Your local newspaper or outlets in a geographic location that the writer has ties to are your best bet to getting your letter published. ​Most newspapers and media outlets have clear submission guidelines you can look into. Make sure to follow these guidelines to improve your chances of getting published. Op-eds can range anywhere between 400 and 1,200 words, depending on the outlet. They often combine both background information and context, as well as a specific opinion or ask. ​Let us know how your writing was received by others and/or whether you were published. Email us photos, comments, and links or share on social media using the #FreeIran2018 hashtag. Lend a helping hand through your time and skills in organizing, communications, social media, graphic design, or web design to help grow the #FreeIran2018 campaign on social media. It is high time for the international community to recognize the desire of the Iranian people for regime change by the people of Iran. It is time for all governments to stand with peace and take all necessary measures to evict the Iranian regime from the region, in particular the IRGC and its proxies from Syria. We are committed to the separation of Church and State. Any form of discrimination against the followers of any religion and denomination will be prohibited. We believe in the rule of law and justice. We want to set up a modern legal system based on the principles of presumption of innocence, the right to defense, effective judicial protection and the right to be tried in a public court. We also seek the total independence of judges. The mullahs’ Sharia law will be abolished.